The valleys in this area are now mostly cleared for farmland. Today we saw firsthand some of the effects that climate change is already having in the Ecuadorian Andes. We are staying in a tiny town called Chugchilan, in a remote area of the western Andes. We love the hostel we are staying in, and today we took a guided tour on horseback through some of the surrounding area, including a cloud forest. As a grad student at Cornell and later, in my job with IUCN (International Union for Conservation of Nature), I have read and studied much about how climate change is affecting the Andean Region. The effects are palpable: Longer droughts, stronger rains, melting glaciers (Andean glaciers are important sources of water for many in the region). But to hear it firsthand from someone who is from the area is a different story. Something seems to grow on every available centimeter in the cloud forest. Cloud forests are so-called because due to topography, the forests are shrouded in clouds and mist for much of the year. The one we visited today is unlike anything I have ever seen – every square centimeter of the forest is covered in greenery, from moss to lichens to ferns, bromeliads, etc. We also saw numerous species of birds, including a very rare sight – a nest of baby hummingbirds. Our guide for the day, Humberto, pointed out many plants that are used locally for medicinal purposes and which have drawn the attention of foreign scientists. 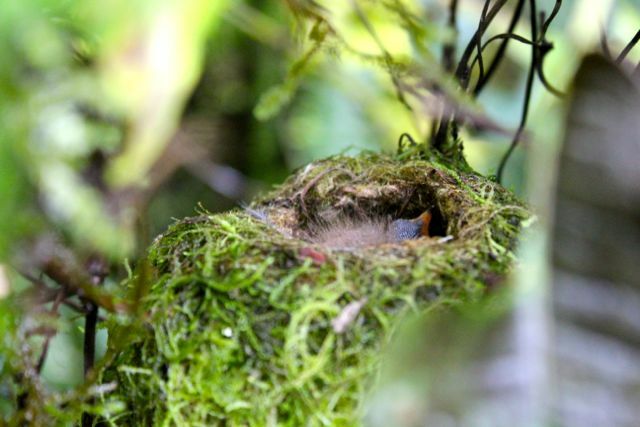 In the cloud forest we saw a nest of baby hummingbirds. The forest is still a haven for pumas and spectacled bears (an endangered species), though these animals are much less common than they were when Humberto was a boy and the forest was larger. Much of the forest in this area has been cleared for agriculture over many years, and the lack of trees, combined with the effects of climate change, is destroying the local way of life. Humberto told us numerous anecdotes about how much the climate and the seasons have changed since he was a boy. The growing seasons have changed – their summers are longer and drier, and they have fewer alternative sources of water during the dry season (in part due to deforestation). As a result, important staple crops like potatoes are more likely to die, and there is less food for local people’s animals, which means that cows produce less milk all year long. This has tangible effects not just on people’s health, but on their livelihoods. For example, the local cheese-producing cooperative in this region is producing only half as much cheese as in previous years because of a widespread milk shortage, meaning they do not earn as much for the community. 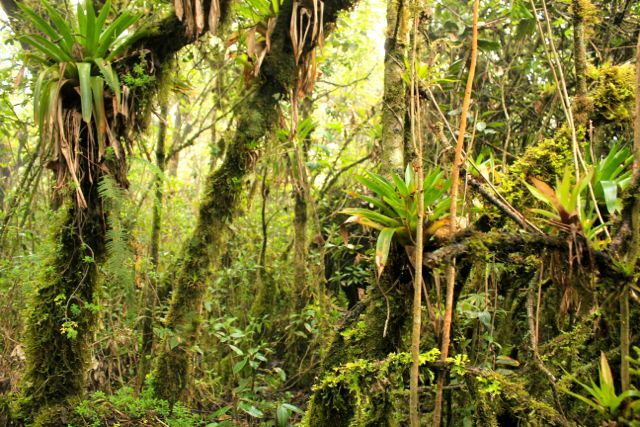 Humberto and a few other tourist guides are trying to protect some of the cloud forest, including reforestation of some areas, as they have realized the effect of the forests on the area’s water supply. 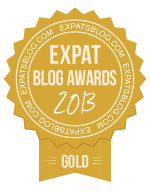 (Our hostel, for example, uses dry-compost toilets to conserve water, which has inspired some of the locals.) Humberto is hopeful that reforestation can engender more tourism, thus providing even higher incomes than that which is provided by clear-cut pastures. 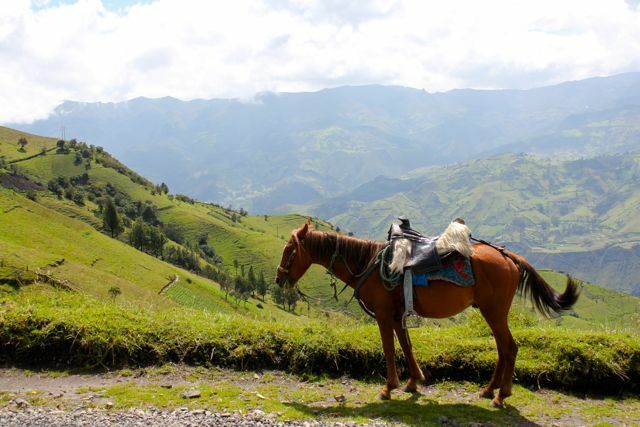 But it may be too late – even with reforestation and newer, more ecologically sound farming methods, the advance of climate change means that life as a farmer in the Andes may not be sustainable.